OK! It's the BIG! Announcement!! Right HERE! Right NOW! Although I don't talk about it much, music is a huge HUGE! part of our lives around here. For the most part, we all like the same stuff around here. One of our favorite's around here is Tobymac. He's on everyone's mp3 player around here. So becasue of that, I was thrilled to pieces to receive an email from his PR firm asking us to help promote his upcoming MOVIE! in THEATRES! of his new album ALIVE AND TRANSPORTED. For the First! Time! Ever!! TobyMac has decided to record a live performance of his show. If you've ever seen any of his videos, you know it's a fast paced, high energy, musically energetic, wonderful wonderful thing featuring some of his best stuff like ... Catchafire (WhoopsiDaisy), Boomin' Love is in the House and Jesus Freak. This is ONE TIME only event happening on June 9th. It's a show not to be missed! You can go here to find a theatre near you - then grab the kids, grab your frineds and high tail it over there June 9th! I've been given the opportunity to give a FREE DVD and CD of Alive and Transported to one very. very lucky winner! Crazy simple, don't you think? And, just cause we want to get the word out - if you post about this and link back? I'll throw in 5 extra entries in your name! Just leave the link to your post in a comment. Well, not really, but there are a coulple of stipulations. You can live anywhere. US or other. No duplicate entries (unless your coming back to leave your link - then you get 5 more). You must be blonde, brunette, re dhead or gray. Natural or not. Taller than 2 foot and shorted than 10 feet. And lastly, because we need to get them to you - you must be willing to share your physical address with me and with the PR firm. They will be doing the mailing direct to you. So, comment away then go get your tickets! And just for the fun of it ... here's a sneak peek! There is an urgent need for prayer over at Heather's. If you could click here and let her now you're standing with them. And school was out. The cries of freedom rang out. - Oh. and the kids were happy, too. It started at 7am this morning. With a deadline of 3pm to get everything in and submitted, both kids were feverishly committed to finals. Jonathan spent several hours doing his Algebra 1 final- all essay questions. Essay questions? in Algebra? Geesh. Things have changed. The kids are required to write out every step of the problem, correctly and get docked points if one thing is amiss. Even if the final answer worked out. Their teacher is a former university mathematics professor and very exacting. Did I mention they'll have him for Honors Geometry next year as well? They're thrilled beyond tears. Kati spent 5 hours on her Algebra, while I was out running errands. I got home to her panicked voice. "Mom, I'm not going to get my Physical Science final done in time." "I finished my Algebra final and hit the wrong button to submit it. It's all erased. I have to start over." Now, understand two things. This kid has worked her self ragged this semester brining her grades up after dragging her feet first semester. And she's done an excellent job. All A's except Algebra and Physical Science. She got within 2% of an A in both of these, so finals are critical. Second, the school has made it abundantly clear that under no circumstances will any work by accepted after 3pm today. No way. No how. No matter what. I did what any mom would do- I picked up the phone and called her teacher. Begged for more time. Success! Kati got a reprieve! A whole day, in fact. She was so determined though, to end it all today she got it all done this afternoon. So - school. is. over. And now, my baby boy is in high school. And my baby girl will get her driver's permit in 4 weeks. And their father is old. Me? I just get prettier as time goes on. Just hopping in from under the fun and games of finals week to say I'M! STILL! ALIVE! The last two weeks have been full of getting last minute assignments done, science experiments (some still growing in my fridge), studying for finals, no internet (Lord help me! ), and finals for both kids. And mom having to tutor Algebra, kindof, again. So, hope to be back when this is all over. If you don't hear from me by Sunday? we're beginning to count down the days til final evaluation for acceptance to the Mayo Clinic Scottsdale transplant list. HOORAY! It's been a long, long road folks, and I'm sooooo ready. Also on the agenda? A fun, filled two hours with the social worker for evaluation. And finanace. Then sometime between Jone 10th and the end of July, we will be presented before the Transplant Committee for approval. They will review all the tests and whatnot and decide if they all agree I'm a good candidate. If anyone says No, we will have to resolve the reasons why and then wait to be re-presented. So, hopefully, by the end of July we start testing living donors. I would be so very appreciative. The code will link people directly to the page I've set up with all the information needed to understand the process, and get involved if they so desire. At the very least, would you consider becoming an organ donor on your driver's license? I promise to keep you posted on the details as we go along. But YEAH! We're finally on our way! May God be your partner on your final ride. who have been injured or killed while riding. It's called the "Ride Of Silence". and to remember them when you're driving and see someone on two wheels. Looking for a location in your area? Please email me your physical address, so I can get your goodie boxes together and out to you! We lead a busy life around here. The kids homeschool 5-6 hours a day, the hubby goes to work FT 4 days a week and then comes home to work another 30-40 hours at his "work from home office" job. With summer upon us, we now have one child old enough to get a job (Lord help me, I'm not old enough to have a child old enough for a job) and due to get her learner's permit in 52 days (No, seriously, no one in this house is counting the day. Really). There is volunteer work, church and a myriad of other things that I'm sure everyone reading this is totally familiar with. Singing to the choir, I am. Even though we are home together most of the time, family time though critical, is hard to come by. Game Night and Family Move Nights. Game Night is usually just the kids and I, becasue of John's schedule. we drag out old favorites like Monopoly or Trivial Pursuit. Last year we discovered a new game called Dread Pirate, and love it! We play card games, and are currently looking for a Jenga game. Family Movie Night falls twice a week, late, after John has finished working. The kids drag their stuff into our room, and we have a sleepover. It's great fun! Living where we do, we only had one movie rental place. Unfortunately, one day it was just closed up and gone. I later heard they went bankrupt. Fortunately, though, I had just won free membership to Netflix through a giveaway at Owlhaven! Waht a blessing it has become! It's pretty simple. I went in and perused the listings of movies they offer (over 100,000 titles), added them to my "queue" with one click of the mouse and Voila! Movies were in my mailbox within two day. There are no time limits, no late fees, and after we've watched them, they just go back in the prepaid envelope. Once they get the movies back (normally the day after I mail them off), the next movies in our queue are pulled and shipped. We have not waited more than a couple of days for the next movies to arrive. The best part is there ARE! NO! LATE! FEES! Frankly, I don't see how the other movie rental place went bankrupt with the amount of late fees I paid to them. So, now for the fun part. To help you get a taste of the joy that Netflix brings, I giving away FOUR! FREE! starter memberships to Netflix. You will get a one month subscription to Netflix, and can rent up to three movies at any time. So, if you play your cards right, you could watch between TWELVE! and SIXTEEN! movies FREE! at home. Without loading up the kids, driving, or paying a dime! Netflix also lets you watch movies on your computer! Instantly! But wait! There's even MORE! 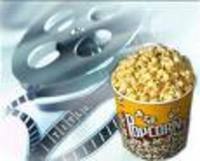 The winners will recieve a Movie Goodies Box from me, full of yummy treats to indulge in while watching their movies! (To win, you will need to be willing to trust me with your physical address). 1) Each comment left will earn 1 entry. 2) Subscribe to Living in Grace through your feed reader (Click Here) and earn 5 entries. (Please let me know in comments which feed reader you subscriber with). 3) Write a post, linking directly back here and earn yest another 10 entries! 4) If you don't have a blog, simply leave a comment telling me the names of the first 3 movies you will rent, and why. You'll get 5 more entries, and I'll get some new movies to add to my queue :) Win! WIN!!! So, who wants some theatrical goodness?! (Due to NetFlix restrictions, you must be a US resident to enter. I'll leave comments open until 8pm PT, Wednesday, May 14th and announce the winner on Saturday, May 17th. I'm thinking I'll need that long to calculate entries and all... sigh). COMMENTS ARE NOW CLOSED! GOOD LUCK TO EVERYONE! CHECK BACK SATURDAY FOR THE WINNER!! Since the theme seems to be inedible things, I'll share this recipe with you (although according to some people who read my blog, but shall remain nameless- these are actually edible). Yummy, Easy Banana Doggie Treats! 1. Preheat oven to 325 degrees Fahrenheit and set the rack on the middle level. Have one or two ungreased nonstick baking sheets ready. 4. For very large banana treats, form the dough into 2 logs, each about 2 1/2 inches high, and place one on each baking sheet. Flatten each log so that it is 6 inches wide and 1 inch high. For medium-sized banana treats, form 4 logs, 2 on each sheet, and flatten each into loaves that are 3 inches wide and 1 inch high. Bake for 30 minutes at 325 degrees Fahrenheit. Remove to wire racks and let rest for 10 minutes. 5. Leave the oven on. Transfer the loaves to a cutting board and slice into 1/2 - 3/4 inch pieces. (It's easiest to slice them on the diagonal, using a serrated bread knife.) Return the slices to the baking sheets and bake for about 20 minutes longer, turning once, until they are golden brown. Cool on racks. Store in a tightly closed tin at room temperature. Note: If you have some cute cookie cutters, simply skip #4 and 6, roll them to a 1/2 inch thickness and cut away. bake for about 30 minutes and start checking them for the hardness you're desiring. Your doggie-oggies will love these. They are great treats with no additives. And your dog will not risk the chance of ingesting something that could harm him. The list of recall items for pet foods and snacks is growing... no worries here. 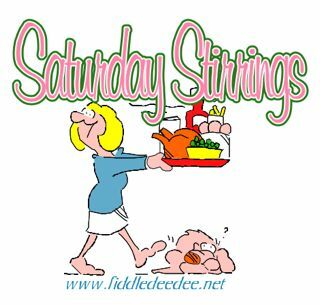 For more great recipes, visit Saturday Stirrings over at Fiddledeedee's Place! ... hop over here and leave a few words of comfort and encouragement? For years, I've spent my life preaching CHANGE IS GOOD! to my employees. totally bought it ot hte fact that change brings growth and new opportunities. Embrace it! Love It! I want things to stay predictable, steady and on course, I want to look at tomorrow, and not wonder what I'll have to rearrange. For the first time in my life, I just want to be complacent. And because that just can't happen, change has again arrived at Cases do Living in Grace. Changes that affect us in so many ways. And so, besides trying to get everyone through the last 9 days of school, finals, summer plans, driving lessons, et al ... I've spent the last couple of days reworking sbudget, bills and plans for the future including evaluations at various clinics for transplant. Realistically, Denver is out. Mayo should be in by July. Phone calls are being made, plans changed. I'm holding frustration at bay, barely, but my finger is in the dike. More than ever, we are living in grace around here. Forcing oouselves to leave the details to God. Letting let go of our plans, and trusting that His plans will work out. It's a tough place to be. But, we are there and we will walk through. Crawl if we have to. Reminding ourselves each step of the way that He is Jehovah Jirah - His Grace Is Sufficient For Me.